Wild turkeys: Delicious fowl or scourge of the row crop farmer? Wild turkeys: From abundant to threatened. When the Pilgrims landed at Plymouth Rock, wild turkey (Scientific name: Meleagris gallopavo) populations were estimated to be in the millions. These large (adults can reach between 8 and 30 pounds) birds were a good protein source for native populations and European settlers alike. Since the days of the first Thanksgiving, unregulated, year-round hunting and the removal of forested acres for crop production led to the decline of turkey populations. The U.S. population plummeted to an estimated low of 250,000 in 1920 (Iowa DNR). In the past 50 years, biologists in Midwestern states have worked hard to help this endangered bird by: 1) learning more about their habitat needs and working to reforest public lands, 2) reestablishing wild turkey populations by capturing and moving individuals, and 3) carefully monitoring both turkey populations and hunting activities. These efforts were successful, leading to self-sustaining populations that can tolerate hunting without marked decline. Thanksgiving dinner and turkey hunting. When one thinks of fall, thoughts of a roast turkey at the Thanksgiving dinner table are not far behind. While most people purchase turkeys from their local grocery store, some dinner tables are adorned with a wild turkey. Growing up in Wisconsin and knowing many people that took part in the fall deer hunting tradition, I was quick to assume that turkey hunting takes place in fall as well. One must never assume. Biologists found that the best way to ensure abundant turkey populations is to regulate hunting activities to focus on harvesting males in the spring. Male turkeys compete for females, the largest male turkeys mating with harems of females. Harvesting male turkeys after they breed in the spring ensures that hunting does not threaten the sustainability of the overall population (Iowa DNR). 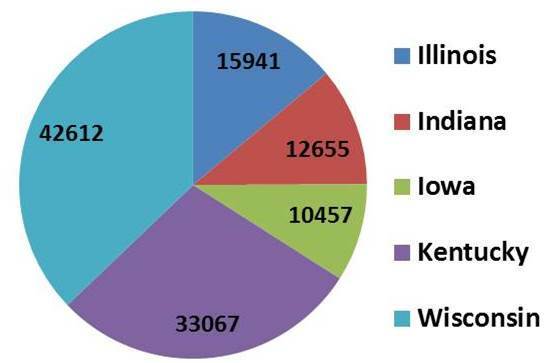 The Illinois turkey harvest (close to 16,000 in 2012) dwarfs that of Wisconsin and Kentucky, but is higher than both Indiana and Iowa (Table, Figure). These harvest numbers reflect the population, which is directly related to the number of forested acres that abut cropland. Table. Spring 2012 wild turkey harvest in Illinois and surrounding states (Source: Midwest deer and wild turkey study group). Turkey habitat and diet: Do wild turkeys cause damage to Illinois row-crops? The ideal turkey habitat is half crop land and half forested land. Although it may seem that a 30 pound bird would have to work hard to defy gravity, turkeys so sleep in trees. The vast expanse of very productive, tree-less cropland throughout much of Central Illinois does not support high turkey populations. Unlike many nocturnal animals that damage crop plants, turkeys roost at night, often spending their days in fields of row crops. Farmers are often wary when seeing large gangs of turkeys moving through their corn or soybean field. 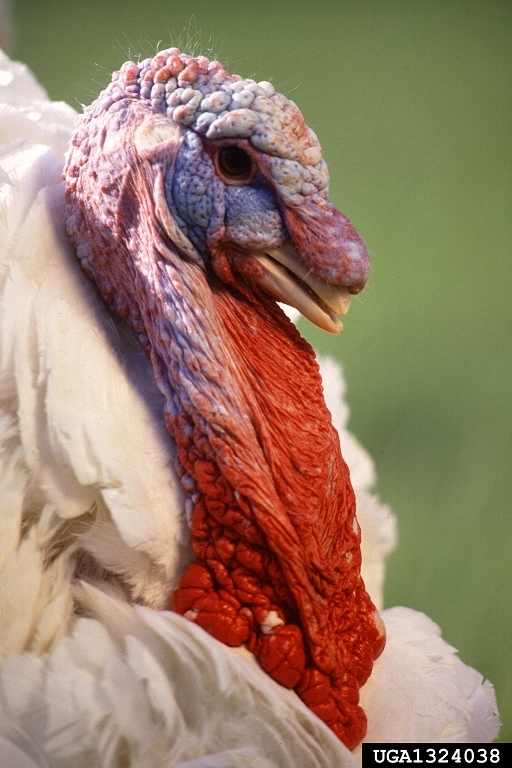 Scientists at the Southern Illinois University Cooperative Research Laboratory, citing farmers' worry, surveyed the diet of Illinois turkeys (Greene, et al.). Although corn and soybean make up a significant portion of the wild turkey diet, all of the grain in their system was foraged from grain that was left in farm fields after harvest. These researchers conclude that although it may initially appear alarming to see a wild gang of turkeys making their way through your fields, the wild turkey may actually be a friend of the farmer, feeding on insect pests. Greene, C.D. ; Nielsen, C.K. ; Woolf, A.; Delahunt, K.S. ; Nawrot, J.R. 2010. Wild Turkeys cause little damage to row crops in Illinois. Transactions of the Illinois State Academy of Science 103:145-152.